Winners of the Asia Young Designer Award (AYDA) India edition have been announced. The contest, which aims to identify and nurture talent among students of architecture and interior design across India and Asia, brought together some of the most reputed names in the industry and the brightest young talents. The 2017 edition received over 350 registrations from 100 prestigious design and architectural institutions. Nippon Paint was the main sponsor for the event. In the Architecture category, Rishabh Jain of Malviya National Institute of Technology Jaipur bagged the Gold Award, while Nithin Jois MS of Siddaganga Institute of Technology, Tumkur won the Gold Award in Interior Design category. The AYDA national gold winners were awarded cash prize of $1,000, a trip to Malaysia for a learning programme, an opportunity to compete in AYDA 2017 – the Asia-Pacific-level contest, and a chance to win cash prize of $1,000 at AYDA 2017, the Asia-Pacific-level contest. Architects, Bengaluru; Pratap Jadav, president of IIID; Ankur Choksi, founding principal of Studio Lotus, New Delhi; Ravi Sarangan, director of Edifice, Mumbai; and Sarly Adre Surkum, founder of Hybrid Architectural Design Firm, Malaysia. The entries were judged on the criteria of Green & Sustainable Design, Design Innovation, Colour Concept and Design Concept Statement. 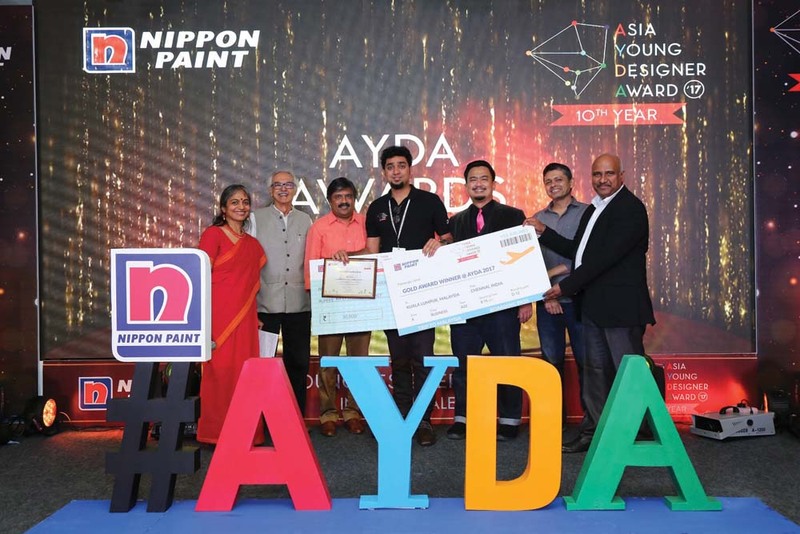 Sharing his thoughts on the sidelines of the award ceremony, Nippon Paint India president-decorative paints S Mahesh Anand said, “AYDA is an international platform for next-generation designers to showcase out of the box ideas. We are happy to bring such a prestigious award to India for the aspiring designers and artist.” He added that this year AYDA witnessed entries with innovative ideas and never-seen-before concepts from leading architecture and interior design institutions. “We at Nippon Paint are committed to inspire local talent and encourage them to push the envelope in terms of what’s possible, and deliver efficient path-breaking solutions. Through this contest we hope to provide our promising young talent an international and real world exposure,” Anand remarked. The jury felt that the award-winning entry in the Architecture category by Rishabh Jain highlighted the ravages of mining through a contemporary design response which framed views of the insensitively mined reserves in Bastar, at the same time creating points for contemplation on the natural reserves we still have left. The design also integrated the tribal community and gives them space for individual expression. What set apart the Interior Design category winner Nithin Jois MS’ entry was the use of virtual reality to simulate different experiences in various fields. The jury’s view was that the use of virtual reality to complete a historic church that is in great disrepair with different parts of it including the roof missing, is probably a first. “Through virtual reality Nithin has recreated interior spaces of yore for visitors to experience,” the jury noted. The event also saw the launch of the theme for AYDA 2018, by S Mahesh Anand – Forward Challenging Design Boundaries. “AYDA 2018 is expected to be bigger and draw more participants and rope in even bigger names in the architect and interior design industries,” he remarked.